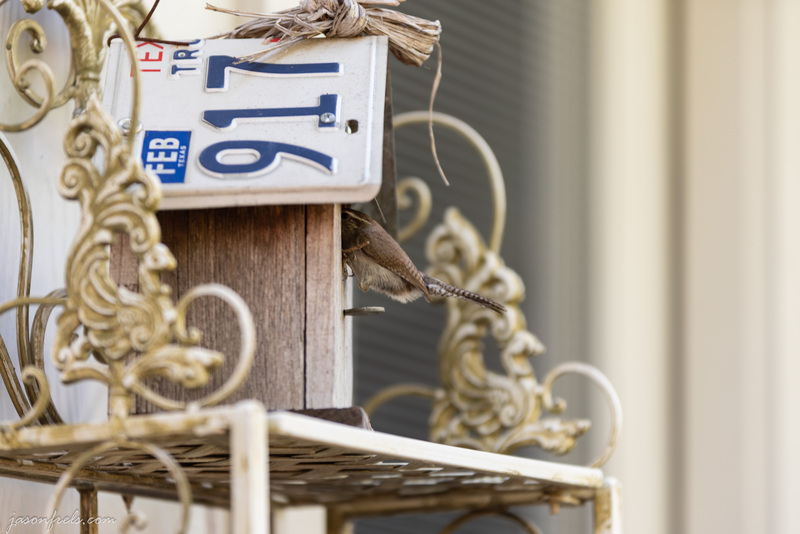 There is a little decorative birdhouse on my back porch with a Texas license plate for a roof. It is right next to my back door, so I walk right by it almost every day. A sparrow, I think, decided to make a nest in it. As I sat out there on Sunday afternoon watching the birds fly back and forth, I decided to go grab my camera and the 70-200mm lens and see if I could get some photos of him or her. I can hear the sound of little baby birds in there and the parents seem to be busy gathering insects for them. 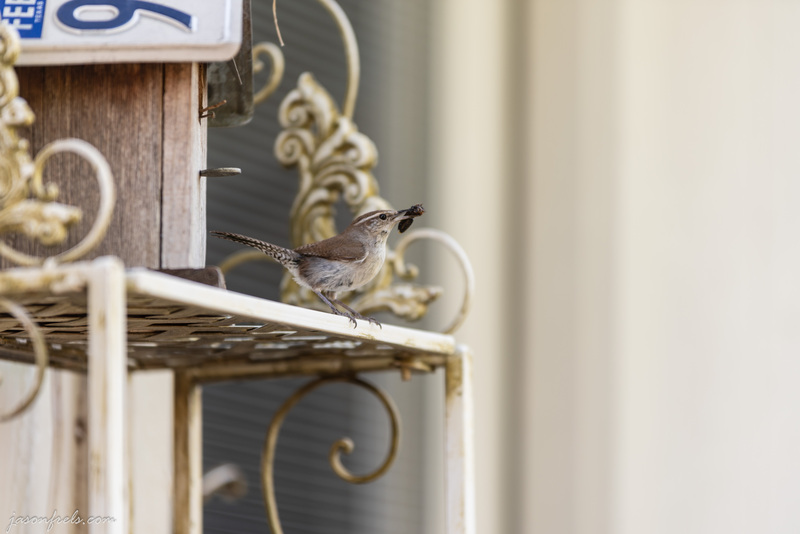 I am happy to have birds eating up insects around my house. In the picture below, the bird has a black wasp, I think, in its beak ready for the chicks. Not sure if the babies were hungry as he kept coming back out with the food still in his beak. 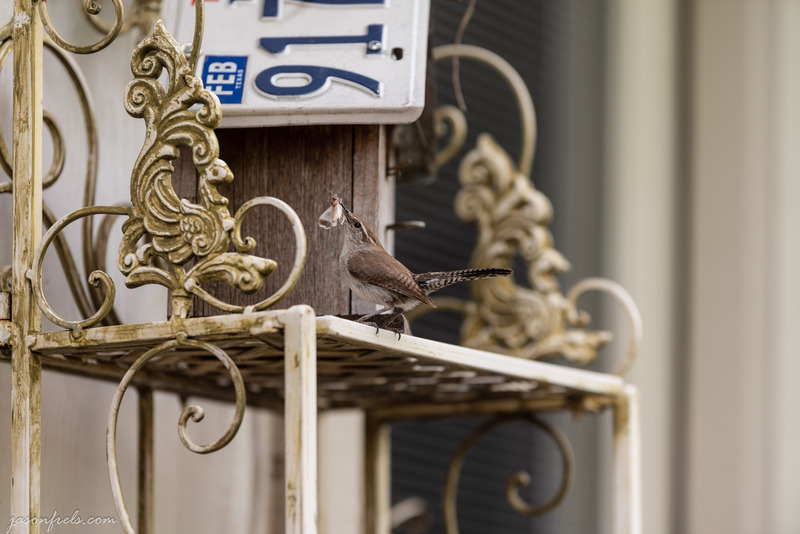 These images were all shot at 200mm, ISO100, f/2.8-3.5, and about 1/100s. Later he returned with a little moth in his mouth. He didn’t seem to mind at all the fact that I was sitting there about 2 meters away with a camera pointed at him. I was hoping to get some action at my bird-bath as well, but nobody needed a bath that afternoon. Well, that’s a lazy Sunday afternoon. Great photos! Did you build the bird house? I like it. The plate is an older one–it’s been a while since the registration stickers went on the plates. I didn’t build the birdhouse. I don’t think I am that crafty. I am not sure where it came from. Maybe goodwill. I don’t remember how long ago we had stickers on the plates. Seems like decades to me. I keep license plates from most of my previous cars hanging in the garage. I will go have a look at some point. I am surprised that these guys would build a nest so close to my back door where people are. They are also just out of reach of a big dog. But the dogs are in the house most of the times, so I guess they will be OK. Glad the birds catch so many insects. I love having birds close to the house. I’m glad you are enjoying them. Nice photo. The dogs may also deter other possible predators so the birds are quite happy. Thanks. I am not great at identifying birds.